I LOVE prehistoric piles of rocks. Standing stones, hill forts, stone circles… love them! Unsurprisingly then, when we were in Cornwall this time two years ago, we visited as many as we could fit in. One evening around dusk we ascended onto the moors about seven miles from Land’s End, the most western point in mainland England. Our destination was Lanyon Quoit, a Neolithic tomb built about 6000 years ago, which means it’s older than the Pyramids at Giza in Egypt. 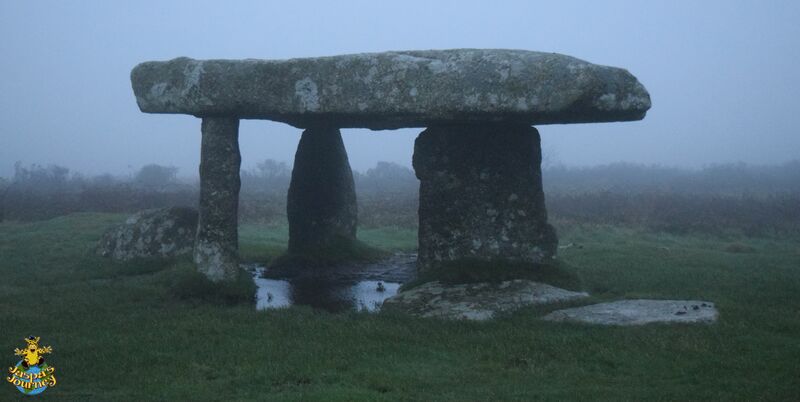 Originally, the 13-tonne capstone stood on four upright stones, not three as it now does. It is said that a man on a horse could ride underneath it without ducking. 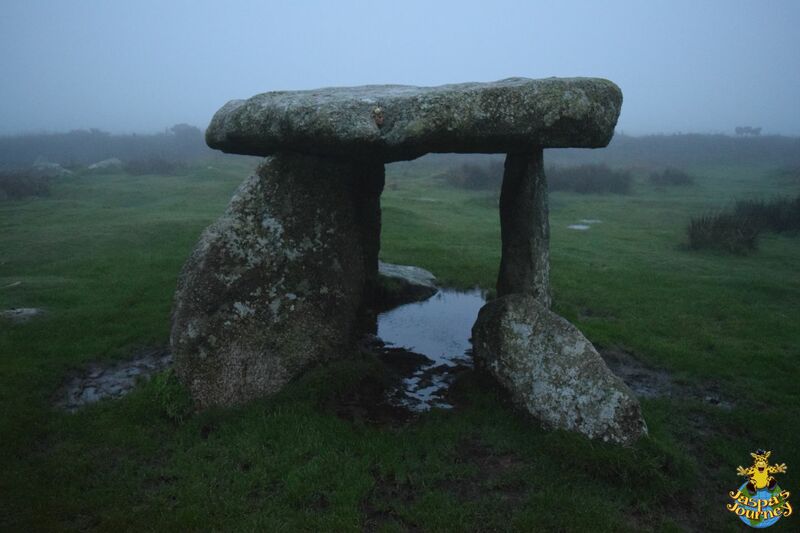 But millennia of treasure hunters digging around the dolmen (as these types of prehistoric monuments are called), weakened the structure, and it dramatically collapsed during a thunderstorm in 1815, breaking one of the uprights. It was re-erected using the three surviving uprights, but is now shorter than it was originally (although still mightily impressive!). 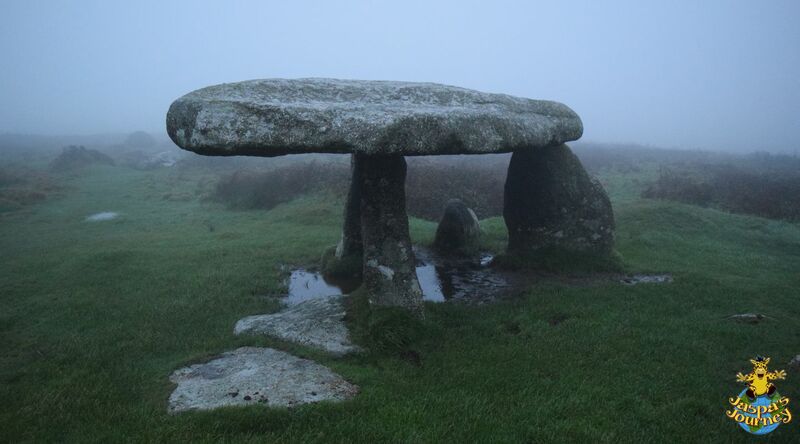 To this day, archaeologists can’t agree about Lanyon Quoit. Was it tomb covered in a mound of earth? Were the stones left uncovered, meant to be seen and impress? Were bodies placed on top of the exposed capstone to be dismembered by wildlife and the elements? One legend even claims it was where King Arthur had his final meal before heading off into his last battle, and where he and his knights will meet again before the End of the World. 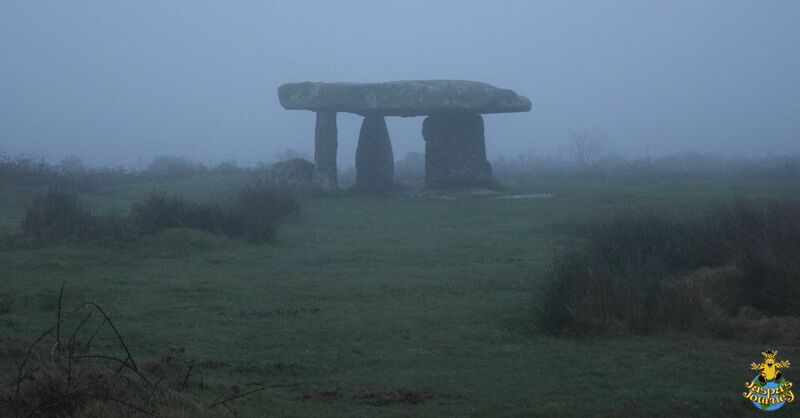 Yet one thing is for sure… Lanyon Quoit would be an atmospheric place even in bright summer sunshine. But a misty, darkening December evening, raised this to a whole new level. This post was inspired by the photo themes of Words including the letter ‘Q’ (in this case ‘Quoit’) from Cee’s Fun Foto Challenge, Ascend from Krista of The Daily Post, and Love from Ailsa of Where’s My Backpack? 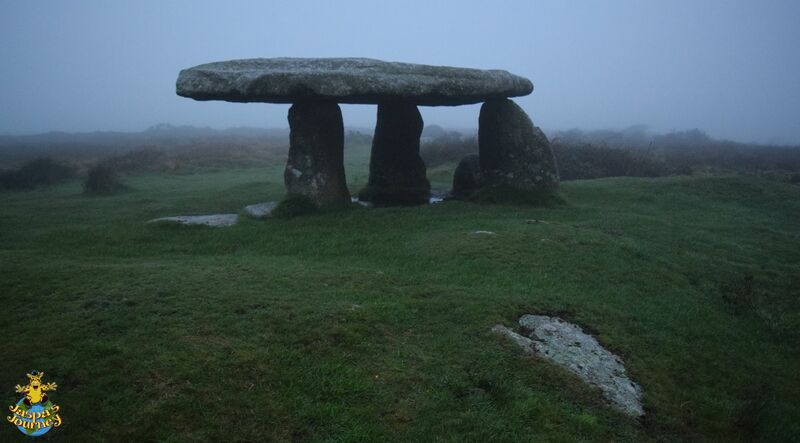 This entry was posted in Adventure, Environment, History, Travel, United Kingdom and tagged Cornwall, dolmen, Lanyon Quoit, moors, neolithic, prehistoric, tomb. Bookmark the permalink. My pleasure, Marit. Glad you enjoyed them. Fascinating. I love this kind of thing, and the fog gives it an eerie vibe. I didn’t, but I’ll take a look. I loved this! The mist looked so eerie and mysterious. Great submission! Oh! I’d love to go to Orkney!